Nestled between overpriced shophouse restaurants, The Sampan is an iconoclastic gastronomical gem in the tourist trappy Boat Quay area. This restaurant serves pan-Asian cuisine with little moderation to the original dishes, thus paying homage to tradition but modernised with small tweaks. The Sampan sits along the beautiful, iconic Singapore River with a stunning view to boot. The Pani Puri ($6++), filled with curried lentils, has dough that is airy and crisp. The mashed curried lentils inside is lightly spiced. Definitely a suitable start to the meal. The Semolina Dusted Baby Calamari ($12++) while not spectacular in any way is decently delicious. I think a simple Chinese salt and pepper spin on it would have made it that much more delectable. For now, I wouldn’t specially order it. The Szechuan Pepper Chicken Spare Ribs ($12++) are reserved in spiciness. I can see how this tweak might allow the food to be more universally appreciated but personally, I’d prefer a greater numbing spiciness – more shiok. That said, the spareribs are moist and well-seasoned. The sweet and spicy sauce that comes with it is unnecessary but it is also an unproblematic addition. This isn’t the first time I’ve seen a healthy, literal (dreadfully unfortunate) take on the Pork and Chicken Choi Bao ($4++), using romaine leaves for the wrap – this also isn’t the first time I’m disappointed by this overplayed rendition. Why can’t it be a semi-roasted leaf of savoy cabbage? Or just stuff it in dough as it is meant to be! The green does not value add. It reduces. However, the filling is a substantial meaty mix of chicken, pork, lapcheong and chestnuts – good flavour. Though, if it had been more focussed – just pork for instance – the filling would have been that much more delightful. I always like my food to have a hint of sweetness. My perfect flavour combi for me is oil, salt and sugar to simulate umami, and their pot stickers definitely hit the spot for me. While these Chicken and Vegetable Pot Sticker Dumplings ($9++) don’t pack as savoury and meaty a punch as your traditional ones, they don’t fail to please. The moist, slightly sweet filling is a wonderful textural contrast to (my favourite part) the crispy disc of fried slurry that holds the dumplings together. 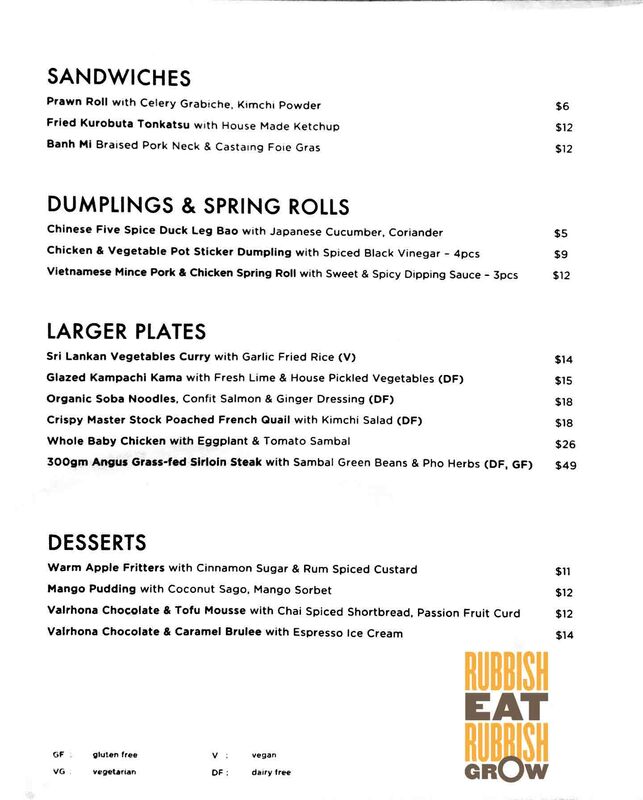 The two salads – Coconut Chicken Salad ($16++) and Crispy Chilli Beef & Mango Salad ($18++) are appetising. The beans could be chopped smaller and seasoned or par-cooked because as it is it doesn’t incorporate well into the general refreshing fruity coconuttiness of the salad – it stands out too much as a raw green. The crispy chilli beef salad seems like a misnomer because the beef certainly isn’t crispy but it is most definitely tender, delicious and the salad as a whole is scrumptious with well julienned carrots and green mango – it is nutty, shalloty, refreshing and filling all at once. The grilled Whole Baby Chicken ($26++) with its tomato sambal accompaniment is moist and flavourful though I didn’t really get the tomato sambal – it is neither here nor there; no true rounded sweetness or tartness of tomato, no true spiciness of chilli. It is enjoyable though – like an atas ketchup. If I were to ignore the naming, this is easily the best dish of the night. Super yummy with the tender chicken and its sweet, savoury, lightly spiced sauce. The Sri Lankan Vegetables Curry ($14++) is easy to eat and well flavoured with cardamom and turmeric and with a daintily sweet aftertaste. The garlic fried rice while not as heartily garlicky as I’d like it is a tasty dish regardless: savoury with a nice thin coat of oil. The two, however, don’t particular enhance or complement the flavour of each other. The Organic Soba Noodles ($18++) feels like an unnecessary anomaly: soba a little too al dente; salmon a little dry. Even if this were executed perfectly, it is just out of joint with the bar-ry, beer type foods that came before. I don’t think it is an imperative to have one healthy dish if that is not the gastronomical vibe you’re going for anyway. The desserts are on the whole a satisfying finish. The espresso ice cream in the Valrhona Chocolate and Caramel Crème Brulee ($14++) while strongly redolent with an earthy coffee aroma isn’t overpowering even when paired with the richly chocolatey crème brulee. The Valrhona Chocolate & Tofu Mousse ($12++) is velvety and smooth and is complemented nicely by the tart passionfruit curd which cuts through the richness. The chai shortbread that comes with the dish doesn’t tie in well with the whole – the shortbread is crumbled too finely making it hard to enjoy the buttery texture of a shortbread; similarly, the finer bits make it hard to locate the taste of chai. But the flavour idea is a good one. The Warm Apple Fritters ($11++) themselves are really thinly crispy with a luxuriously comforting moist and warm cinnamonny apple puree. The rum-spiced custard that comes with however is a little thin – both in texture and in rum-flavour. A more gooey, creamy, alcoholic custard would have hit the mark. 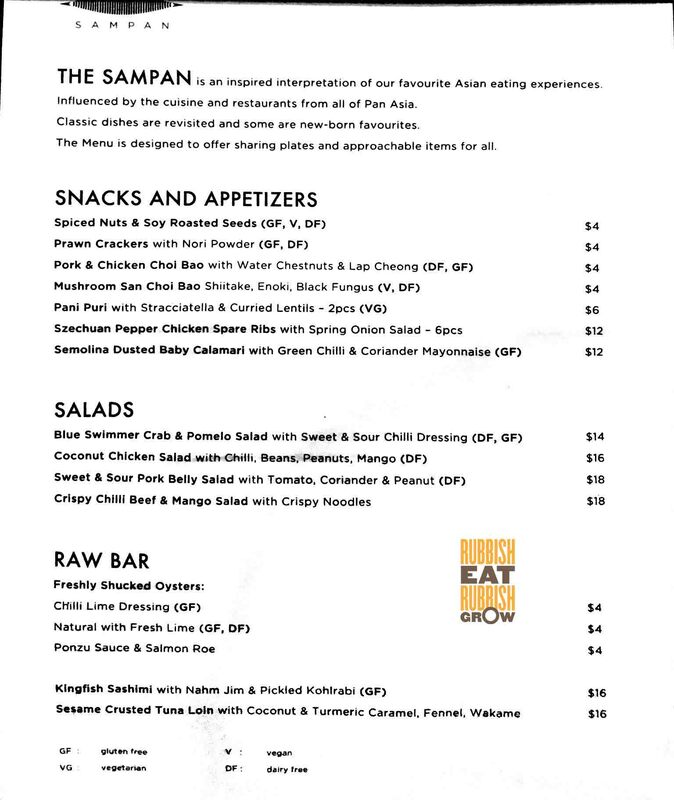 On the whole, The Sampan is worth a visit for the variety of well-executed and modern Pan Asian cuisine. The food is delicious; the price affordable. This makes for an easy, breezy post-work tummy treat or a casual weekend gastronomic excursion.